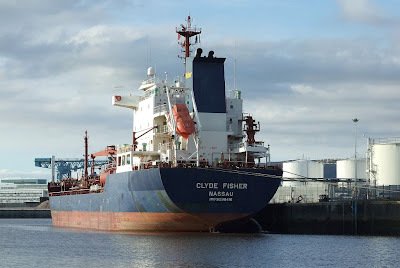 One of the largest tankers currently operating for James Fisher Ltd is CLYDE FISHER, which flies the Bahamian flag although she is owned by a company registered in the Marshall Islands. On a ten-year bareboat charter to Fishers, CLYDE FISHER was launched in October 2004, and the 12,984 tonne deadweight ship joined their fleet in February 2005. With an overall length of 127.2 metres, her beam is 20.4 metres and her draft 8.7 metres. CLYDE FISHER was built by the Samho Shipbuilding Co Ltd in South Korea. With a name like that she'd look better if the PoR was Glasgow or Greenock.